My husband, who grew up in a racing family, watched the Indy 500 every year of his youth, some years on TV but many times from the stands at turn 1. 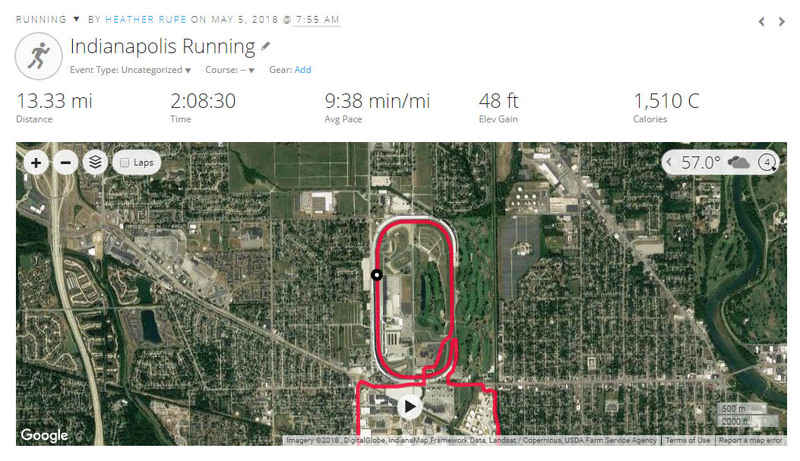 When I read that the Indy Mini Half Marathon included a lap around the famous speedway, I knew that I had a chance to finally convince my non-runner hubs to do a half marathon. He had always joked that the only half he would do would be the “Maui Half” but I dangled the carrot of Indy and he took the bait. We had begun seriously talking about a trip to Hawaii in the next few years, and realistically I knew that after his first half, he would much rather lay in bed and rest than hike volcanoes. Indianapolis seemed a better bet. He followed Hal Higdon’s beginner half training plan as close as he could. Around week 3 of training he hurt his back and needed a week to recover, but managed to get right back on track. 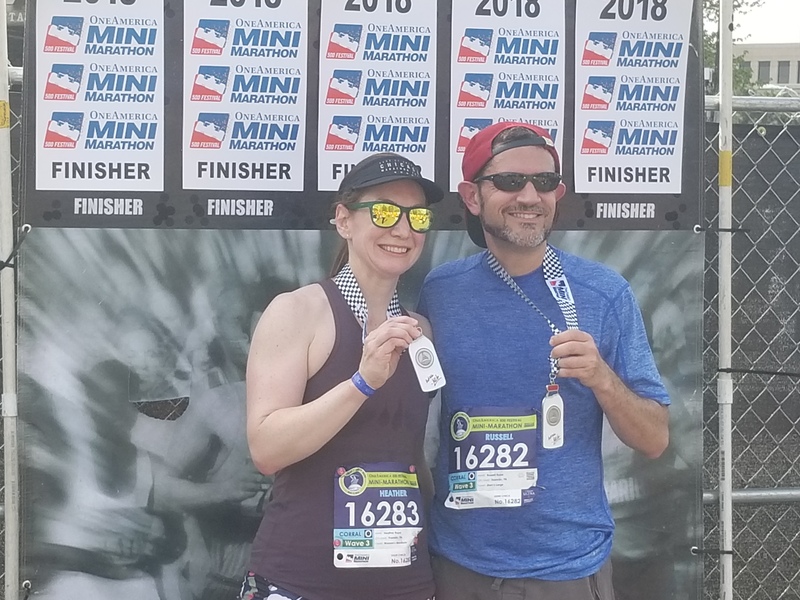 His knees began to hurt with increased mileage, but he switched to HOKA running shoes, added some core work and tried knee braces and was able to push on through. His baseline was barely running 2 miles a couple times a week on the treadmill. At the beginning of the process he shook his head incredulously at the training plan questioning how it it was possible to ever run so far. I encouraged him to trust the process as each week we added another mile to the long run. When we hit 8 miles for our long run, he found his pace. He realized after 4 miles it all feels the same. The running zone. We dropped the kids at school Friday morning then headed up 65 for an easy 5 hour drive to Indy. It had been almost a year since we had gotten away together as a couple, so a big part of the fun of the weekend was simply enjoying each other’s company. I don’t love road trips, but I also have become jaded by years of traveling with small screaming children. Five hours with a cute, witty companion was actually quite lovely. In my travel calculations, I forgot to consider the time change and stopping for lunch, so we got to the expo a little later than I planned. I was hoping to make it in time for the Meb Keflezighi meet and greet, but that didn’t happen. The expo was was huge even though this race was only a half. There were 20,000 runners, so the swag stands were in full swing. 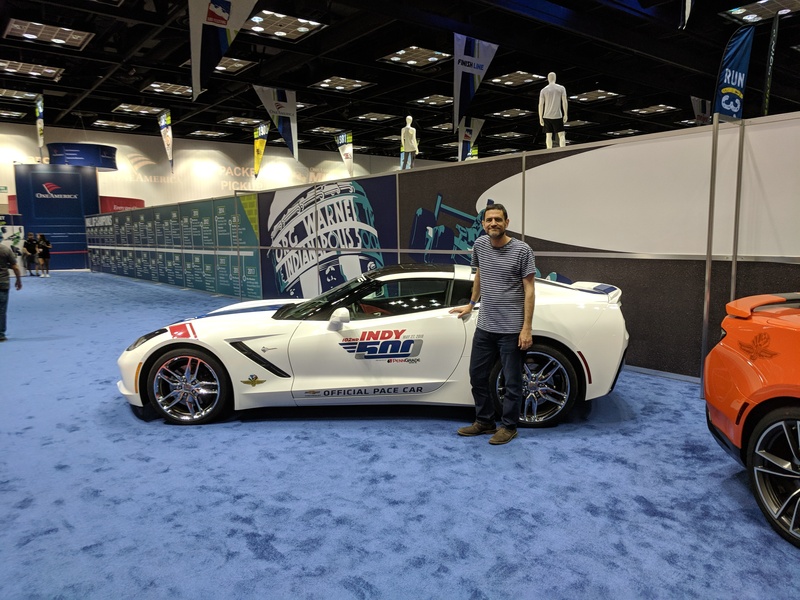 As we walked into the expo we were greeted by the pace car for the Indianapolis 500, and I knew we had chosen the right race. The Indy Mini is part of the city’s May festival that leads up to the 500 on the last weekend of the month. Throughout the town we saw banners celebrating the race. I get the feeling that the 500 is Indianapolis’s Christmas, and May is their December. I could feel the excitement in the air, and Russ was all grins and nervous energy as we picked up our shirts and bibs. The convention center was less than a mile from our hotel, so after we took in all the sites, we headed back to the hotel to get changed for dinner. We picked the right race. We ate at Osteria Pronto, an Italian place in the Marriott Hotel downtown. The atmosphere was that mix of modern and rustic that seems the current trend. The food was good, but not life changing. Russ had the lasagna, but despite never having GI issues before, found it didn’t sit that well overnight. We stayed at The Conrad, which was a gorgeous hotel located a cozy 2 blocks from the starting line. They had coffee and bagel for the runners in the lobby race morning, but we had lucked into some free room service coupons, so we started the morning with french press coffee and danishes. We didn’t have to be in our corral til 7:30, so we were able to sleep in til 6 (which felt like 7 am ‘our time’). As soon as we hit the lobby, you could feel the excitement of the crowds. We followed the bib wearing masses to the start. We watched the runners pile into to the corrals, as we stretched out our quads. 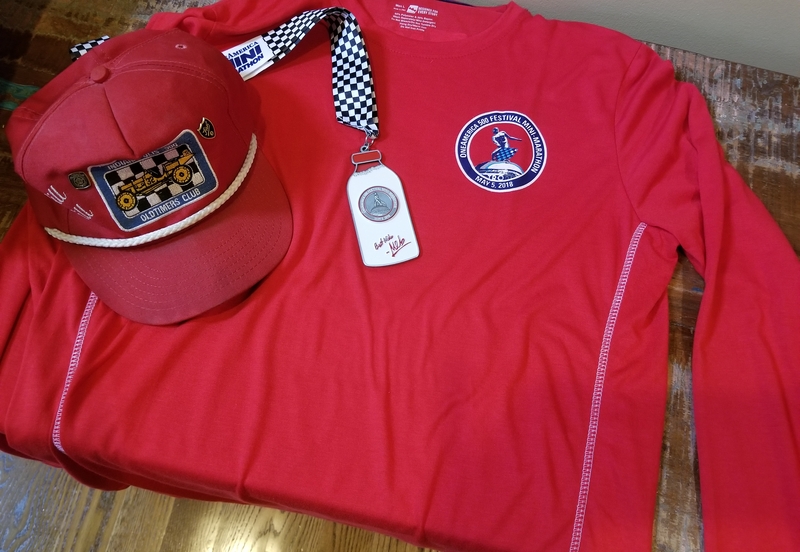 Old, young, svelte and plump; all in it together to run 13.1 miles and a rare chance to make a lap around Indianapolis Motor Speedway. 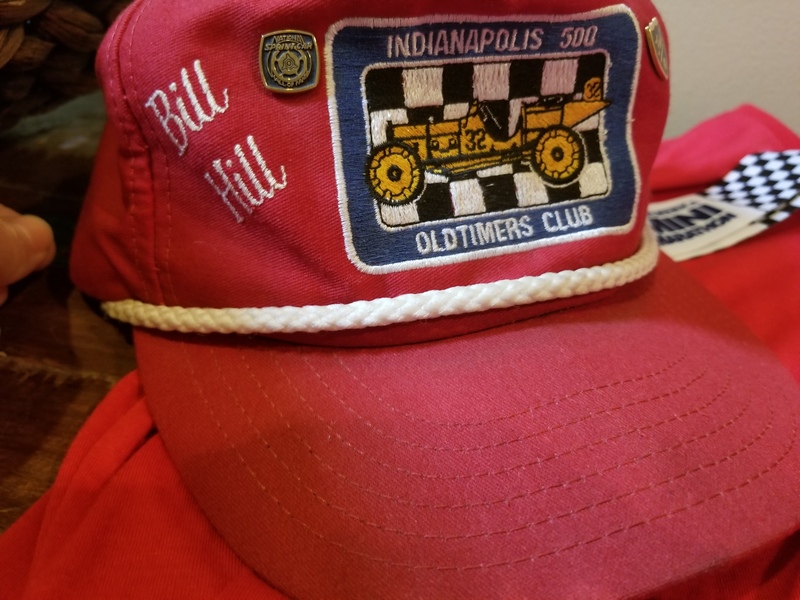 Russ’s step father Bill had passed this last fall, so as we prepared for the race, Russ donned his late step father’s Indy 500 Old Timers Club hat. Bill was a racing enthusiast, writer, announcer, promoter, and risk manager for the largest motorsports insurance company. The years that Russ had see the Indianapolis 500 in person, it had been with his mom and step dad, so this race was a special. Our wait in the corral seemed shorter than usual (perhaps because my last race was at Disney where half the event is in the corral), but still festive and nerve wracking. Runners filled with nervous energy were jumping around and fidgeting with their Garmins. Blaring music filled the air, as the occasional beach ball bopped us on the head before we could send it flying back across the crowd. Russ’s goal was 2:15, so our corral was in third wave. We were quickly off through the streets of Indy. The crowds were thick and we spent a lot of the first two miles weaving through the runners trying to maintain a 10 min/ mile pace. The area between downtown and the speedway was not that visually appealing, consisting mostly of run down houses, many with bars on the windows. Despite the aesthetics, the crowd support was great, and the volunteers were out in full force with water and gatorade stations at every mile. There were also abundant porta potties with minimal lines. Heading down Main Street of Speedway, Indiana, a small town completely inside of Indianapolis. The excitement built as we headed down the stretch toward the speedway, in the shadow of the giant walls of the grandstands. 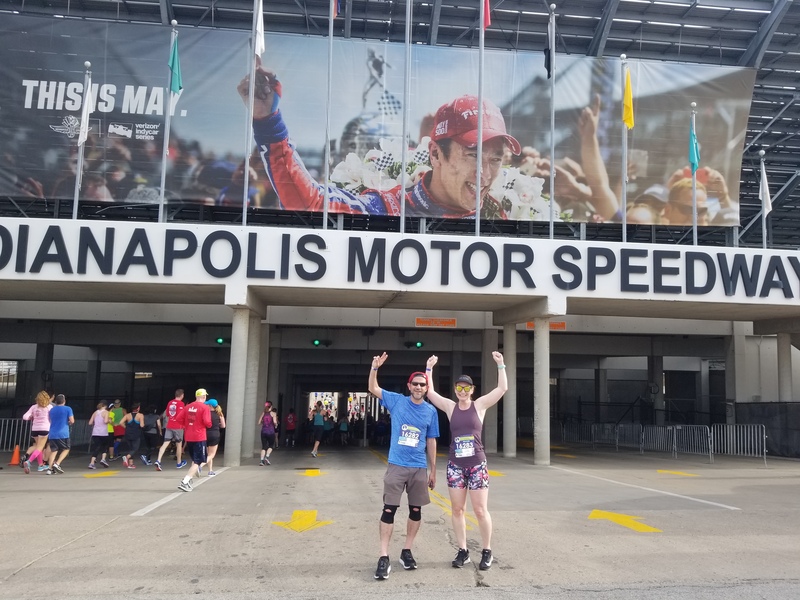 We then made a sharp left going through a tunnel that filled me with childlike excitement and then we emerged in the infield of the Indianapolis Motor Speedway. Who doesn’t love to run through a tunnel? The track is 2.5 miles long, lined with a quarter million seats. The music was loud and the runners were giddy with excitement, but I know that could be no comparison to what race day must feel like. I can’t fathom racing a car around that track 200 times at speeds of over 230 mph. Russ was all grins as we ran on the famous speedway, filling me in on Indy trivia, like how the winner always drinks a glass of milk and in the 90’s a tradition started where the winner of the race would get down and ‘kiss the bricks’. The original racetrack was all bricks hence the nickname ‘the Brickyard’. When it was finally paved, they left a literal 3 feet of bricks at the finish line in homage to the famous nickname. 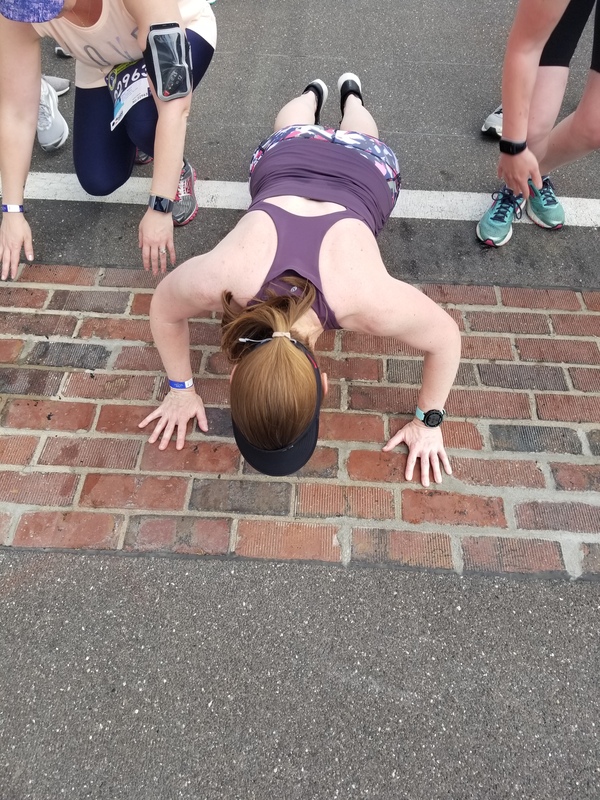 As we approached the start/ finish line of the speedway, we were give the opportunity to stop and ‘kiss the bricks’. Exiting the speedway, we cruised back toward downtown. 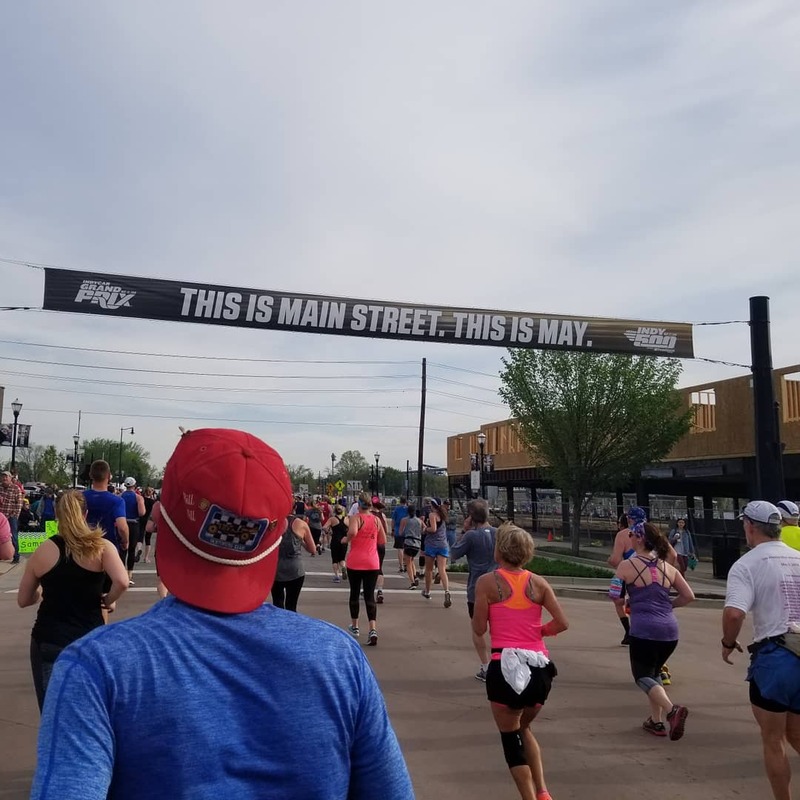 Around mile nine, I saw a man lying lifeless beside the course, as a women knelled next to him removing his bib, for what I presumed was to access his emergency contact. I went into full doctor mode and rushed over to assess him. Luckily he informed me that it was only a sprained ankle, before I began the chest compressions and emergency breathing. At mile 10 we made a pit stop and when I asked Russ how he was feeling, he said that he felt awesome. “That means it’s time to speed up” I answered with a mischievous grin. We ‘stood on the gas’ and headed for the straightaway. The final half mile was lined with checkered flags, sticking with the racing theme. We finished strong and were rewarded with a milk jug shaped medal. We hydrated, called the kids and walked the couple blocks back to our hotel, once again thankful for the close location The Conrad. We took it easy the rest of the day and then ate a fabulous steak dinner at the Capital Grille, replenishing all calories burned in the race. 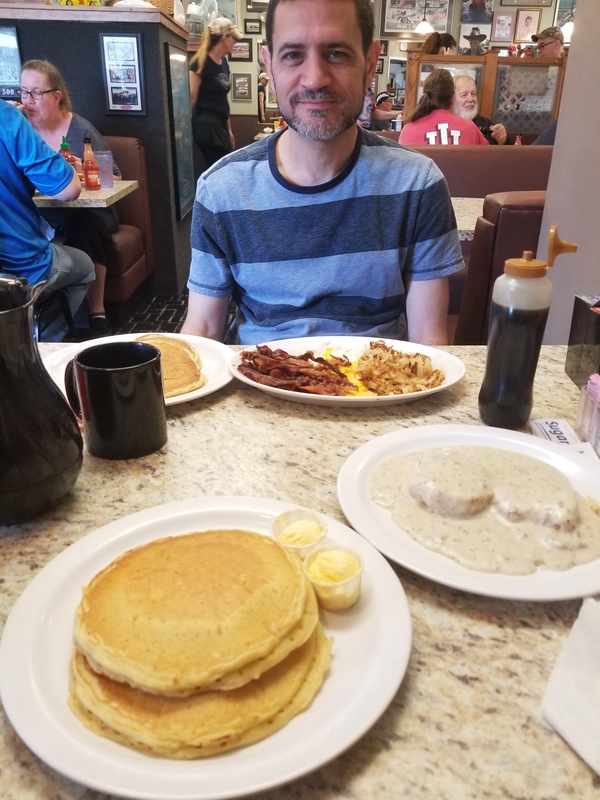 We slept in Sunday, then ate at Russ’s favorite local diner, Charlie Brown’s. It is the kind of place that’s filled with locals and the couple beside us literally ordered ‘the usual’. The portions were huge, greasy and delicious. We left Indianapolis feeling a sense of accomplishment. We hauled our swollen bellies and sore knees back down I65 to Nashville. It was a fantastic weekend and great first (hopefully not last) half marathon for Russ in memory of a great man, Bill Hill. 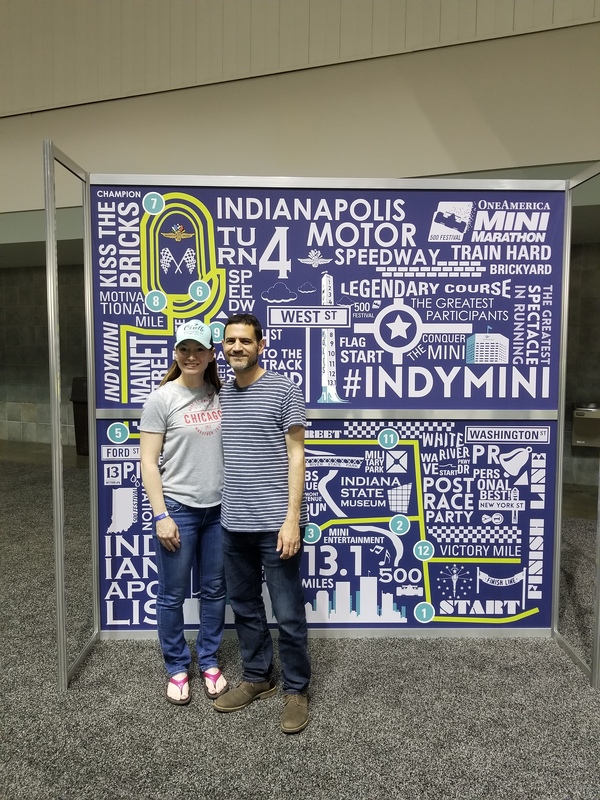 The Indianapolis 500 is known as the “Greatest Spectacle in Sports” and while the Indy Mini may not be ‘the greatest race ever’ it still proved itself to be a fun, flat, well supported half. Russ beat his goal by 7 minutes and finished strong. 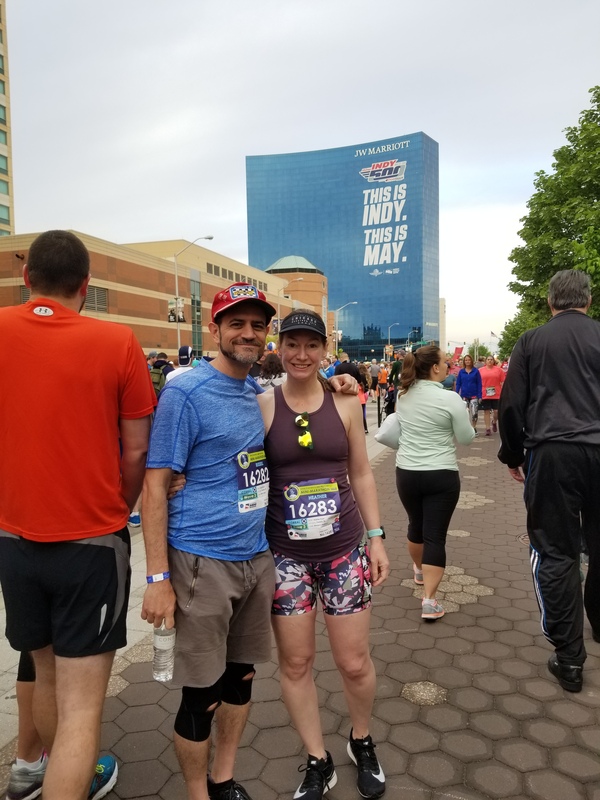 This entry was posted in Running and tagged Half Marathon, Indy Mini, Running on May 29, 2018 by drrupe.